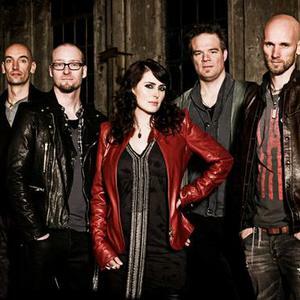 Within Temptation is a Dutch symphonic metal band formed in 1996 in Waddinxveen, Netherlands. The group consists of Sharon den Adel (vocals), Robert Westerholt (guitars), Jeroen Van Veen (bass), Martijn Spierenburg (keyboards), Ruud Adrianus Jolie (guitars) and Mike Coolen (drums). Despite being labeled by the media as a gothic metal band, Within Temptation consider themselves "more a symphonic rock/metal band ... we are... no gothic band". In 1996 the vocalist Sharon den Adel and guitarist Robert Westerholt founded Within Temptation. After the release of their first album Enter in 1997, the band became prominent in the Dutch underground scene, playing their fourth gig at the legendary Dynamo Festival. In 1998, they followed up with an EP, The Dance, and progressed to the main stage at Dynamo. It was not until 2001 that they became known to the general public, with the single "Ice Queen" from the album Mother Earth, which reached #2 on the Dutch charts. Since then, the band has enjoyed success throughout Europe, winning the Conamus Exportprijs four years in a row as well as several Edison Awards. Their next albums The Silent Force and The Heart of Everything debuted at #1 on the Dutch charts. In 2008, the band played to a sold-out Ahoy with the Metrople Orchestra and the Pa'dam Choir. This concert was released on the Black Symphony live DVD/CD. In 2009, the band released An Acoustic Night at the Theatre, which featured live tracks from their successful acoustic theatre tour. The album also contains the single "Utopia", a duet with English vocalist Chris Jones. After a short hiatus, the band returned in 2011 with The Unforgiving, a concept album. The album was released on March 29 and debuted at #2 on the Dutch charts. In addition to the album, the band are releasing a forthcoming comic book series and several short films. The first short film, "Mother Maiden", was released on January 31, and the second, "Sin?ad", was released on March 21. Two issues of the six comic books have also been released.